24-hour automatic control of standby generator sets, 365 days a year. Most of the buildings need almost permanent power supply. Automatic Transfer Switch (ATS) is essential. The ATS could Immediately senses when power is interrupted and automatically transfers power generation responsibility to the generator. And also the ATS could senses when power is recovered and transfers the load back to the utility source and signals the generator to shut down. How the whole system Work? 1. ATS monitors voltage coming from utility source. 3. When the main power is restored, the ATS will sense it and automatically disconnects the generator and reconnects the main power. At rated speed, the ATS will transfer load to emergency power with available size ranging from 20A to 3200A. Sunshine could supply all these size. 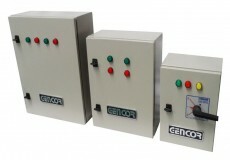 NEMA 1, 3R, 4, 4X, and 12 enclosures.